This stop was a crazy study of our Earth — including a supervolcano, volcanic hotspots, tectonic faults, and powerful earthquakes — as we visited Grand Teton National Park (#14 thus far), Yellowstone National Park (#15), and Earthquake Lake… as well as continuing our journey following the mighty Snake River. During this adventure, we traveled through Idaho, Wyoming, and Montana. 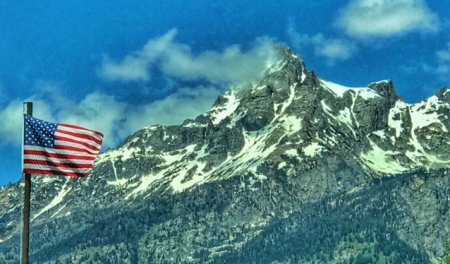 We started the adventure at Grand Teton National Park, founded in 1929. The mountains here are the youngest in North America — at only about 9 million years old — yet the rock of the mountains is some of the oldest. As is our tradition, we stopped first at the visitor center (the Craig Thomas Discovery and Visitor Center in Moose) to learn more about the park and plan our two-day visit. 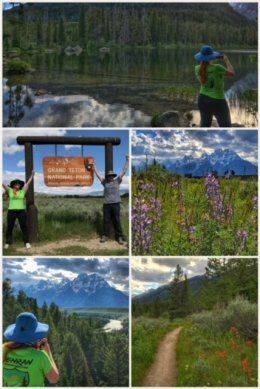 Because the light was interesting, we next headed up US 191 to capture the mountains along several scenic overlooks, including the famous spot where the great Ansel Adams took his picture, The Tetons and the Snake River. We returned the next day, focused mainly on visiting Jenny Lake for more than the obvious reasons. 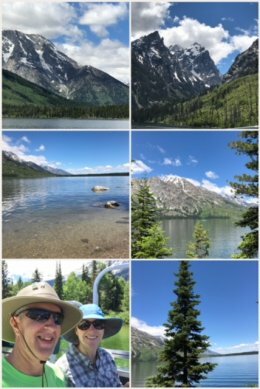 You can actually hike along the shores of the entire lake (about a 7.5 mile loop), but we opted for a combination of hiking around the lake and taking a scenic boat cruise on the lake. The lake, perhaps the prettiest in the national park, is almost 1,200 acres in size, and was formed about 12,000 years ago as glaciers pushing rock debris carved the Cascade Canyon. While most of the glaciers are now gone, you can actually still see one the remaining ones — Falling Ice Glacier, located on Mount Moran. The one-hour narrated cruise was a blast, as our guide was knowledgeable, funny, and had a deep appreciation of the park. We learned about the history and geology of the area, as well as the flora and fauna found around the lake — with lots of talk of bears, moose, and elk. 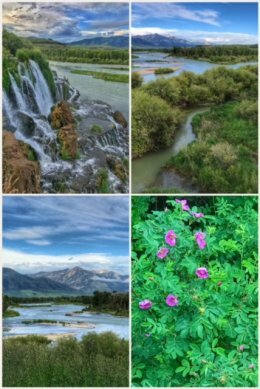 While taking a break from visiting the Tetons, we decided to spend time enjoying the Snake River, located right across from our RV park. The highlight was a little known (and fairly hard to find) waterfall into the Snake River — Fall Creek Falls — which is located in the Swan Valley off of a Forest Service Road you access from U.S. Highway 26. 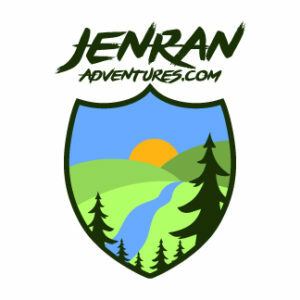 The views of the 60-foot falls and the Snake RIver are quite amazing, but good luck finding the almost hidden trail located at an unmarked turnout about a mile and a quarter after you turn off Highway 26. The wild rose bushes all along the roadway were intoxicating in their scent. Next up was Yellowstone National Park, established in 1872, and the nation’s first national park. It is also one of the most popular parks, so we strongly suggest going in late spring or early fall if you can; if you can’t, bring a lot of patience… for crowds and crappy drivers. At the heart of Yellowstone (and many other locations that we have been traveling) is volcanic activity. The difference is that under Yellowstone is a supervolcano (a volcano that has had an eruption of magnitude 8, which is the largest value on the Volcanic Explosivity Index) — which erupted more than 600,000 years ago, collapsing the cone and creating a 30 x 45 mile giant caldera that is a big part of the national park. 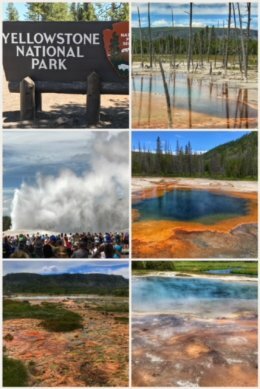 When visiting, you’ll want to see the hot springs, geysers, travertine terraces, fumaroles, and mudpots — as well the scenic rivers, lakes, and the Grand Canyon of the Yellowstone River. 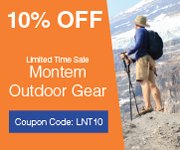 You’ll most likely also see deer, bears, and bison. We spent day one visiting the southwest side of Yellowstone, checking all the beautiful and spouting stuff, starting with Old Faithful and working our way to the Black Sand Basin (which contains a small collection of geysers and colorful hot springs, including Rainbow Pool), Biscuit Basin (which includes a collection of small thermal features, including Sapphire Pool), Midway Geyser Basin (which includes Excelsior, the world’s largest geyser; and Grand Prismatic, the world’s largest hot spring), and ending with the Firehole Lake Drive (a 3-mile loop that offers you close-up views of geysers and hot springs, including Great Fountain Geyser and White Dome Geyser). 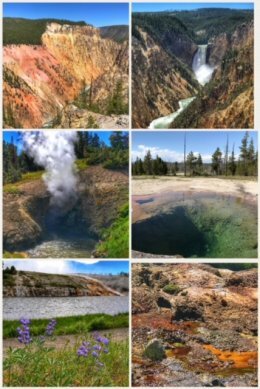 Our second day at Yellowstone was spent in the central part of the park, searching out more mudpots at the Mud Volcano area, as well as admiring the Grand Canyon of the Yellowstone River and the Lower Falls from Artist Point. We ended the day with a visit to Artist Point, along South Rim Drive, which offers wonderful views of the canyon, river, and 308-foot lower falls. 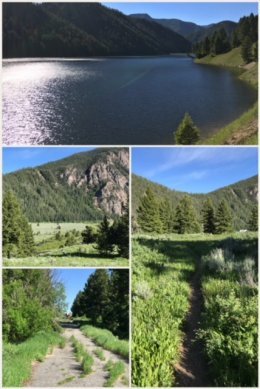 But our adventure was not over because we stumbled upon an amazing area in Montana, just northwest of Yellowstone, known as the Earthquake Lake Geological Area — and located in the Custer Gallatin National Forest. This massive lake was formed — as you might guess from its name — by a massive earthquake (one of the most powerful ever recorded in the Rocky Mountains), which measured 7.5 on the Richter Scale, and sent 80 million tons of rock crashing down in the Madison River Canyon, blocking the river — creating a lake 190 feet deep and five miles long. Three sections of the old highway fell into the lake; an old section of the highway can be seen in the photo above. Hundreds of people vacationing or living along the river got trapped — and, sadly, 28 people (including several families) perished in the quake. New Highway 287 offers numerous stops along the way to see the power of that event… concluding with a beautiful Earthquake Lake Visitor Center, partly built upon the rubble from the massive rock slides. And while things are calm now, the geological tensions are still active underneath the surface — just as at Yellowstone… just as at Mt. St. Helens, Mt. Rainier, and so many other places we have visited. Next up? A little R&R and family business with friends in northern Montana. Happy 4th of July!